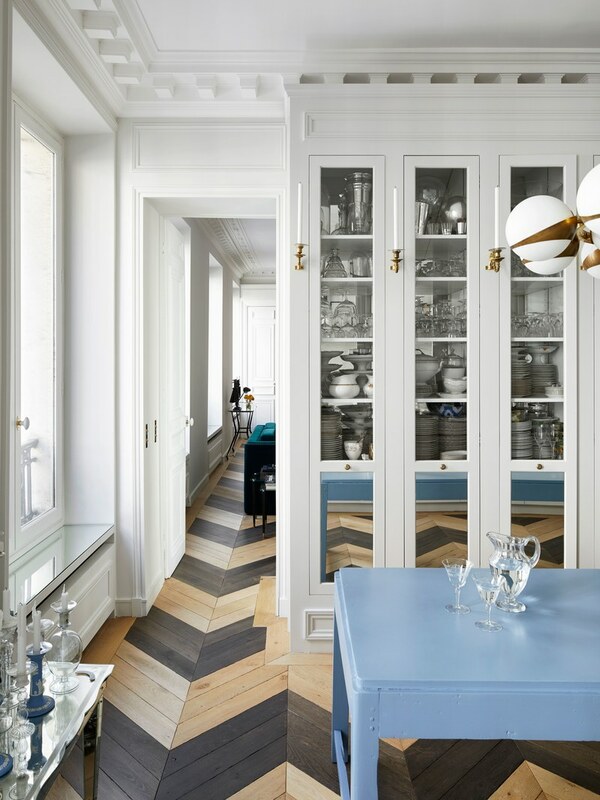 Making a home in the 9th arrondisement in Paris, fashion designer Alexis Mabille spent six months in renovations restoring his 19th century Parisian apartment into a reflection of elegance, simplicity and uniqueness. As you tour the entire home (I have selected a few of my favorite rooms below and above), you’ll notice, only one window has window treatments. 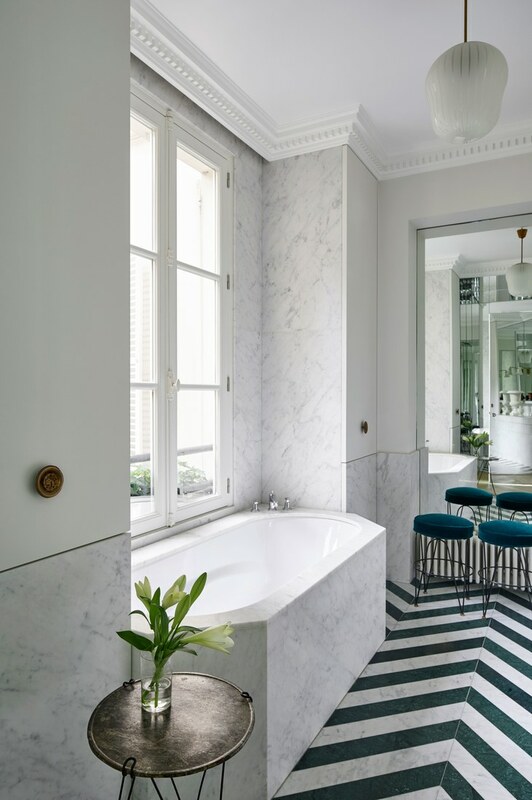 An intentional choice by Mabille, the desire to have as much natural light as possible was the goal, and pairing this choice with an abundance of white marble, this apartment is most certainly going to be light and bright. The library of books above the master bed certainly caught my eye, as I too would feel very comfortable with similar decor. One is never alone if one has a book, non? 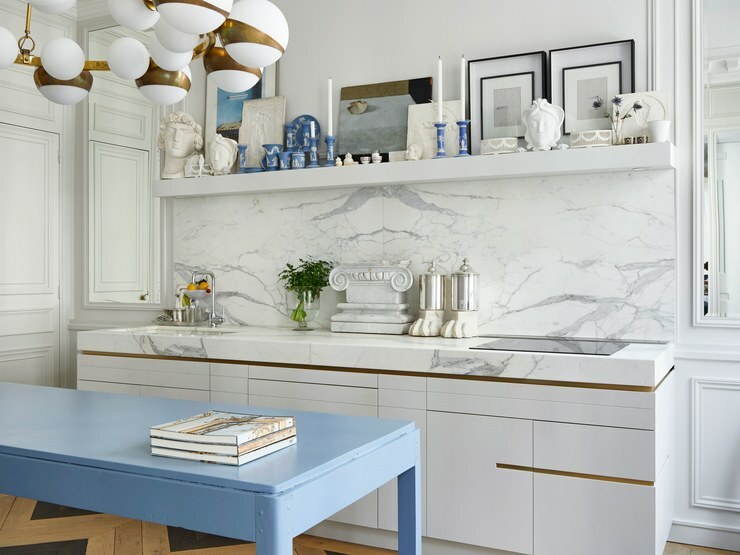 Be sure to take a close look at his kitchen cabinets as you will notice there is glass above three feet and then a mirror offers light and a reflection of more light to expand the space which reaches to the ground (and covers anything you don’t want to be seen or have to always have organized and stacked neatly). Lastly, the soaking tub in the master suite is ideally placed in my opinion – next to the window (and thus French windows). Offering natural light in spades, the ability to welcome a breeze while soaking in a hot bath is a truly luxurious experience as I shared this summer while vacation in Provence. Enjoy the tour and view the entire interview and see more rooms here at Architectural Digest. As much as I love books (I’m a retired librarian), the very sight of them in a bedroom makes me want to sneeze. So much dust! Alexandra Stoddard once wrote that she found books in her bedroom to be “agitating” and I tend to agree. I need severe minimalism in my bedroom. Lovely rooms and so classically Parisien. 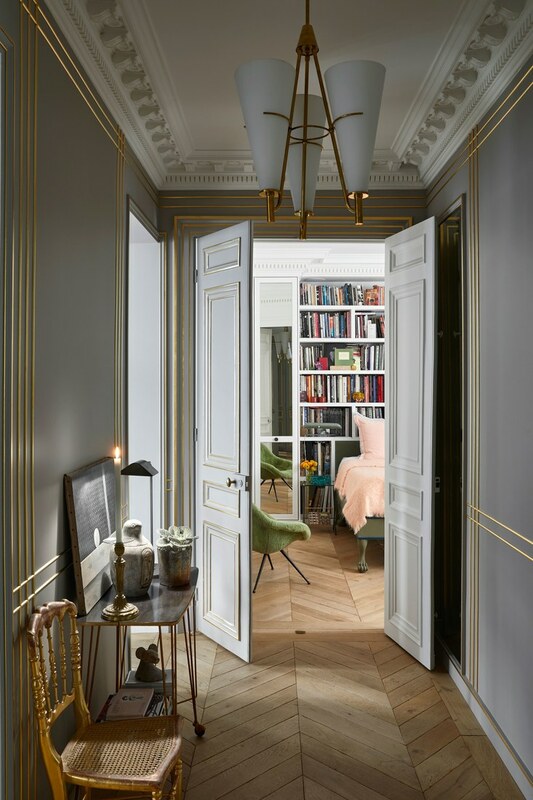 The style is ageless: tall doors, latch windows with hinges, chevron patterns, wood, mirror, superlative finishing details echoing la belle époque (like the wall & ceiling details), marble everywhere! C’est vraiment classique mais au-courant à la même temps: J’adore. Merci for sharing this gem. My pleasure and I do love your detailed eye! It truly is a Parisian space to call home. One would certainly know they were in Paris when they woke up, even before looking out the beautiful windows. This is truly lovely! I would certainly enjoy living here. The bedroom with the books surrounding is perfect. I would feel right at home. The decor seems quite ideal. Thank you for sharing. Where do you keep all the bills and magazines that one accumulates? Wish my kitchen looked so beautiful. Are all the flowers real? Love Paris, thank you for your tour.